IT Governance can’t help Digital Transformation! Govern Business Capability instead. Let’s be clear: Digital Transformation is real and happening now to the way we do business, live our lives and govern our nation, at any level, in any context. We are using digital era technologies to do better things we have always done, and to do new things that we were not previously able to do. From our individual lives to the halls of power, digital transformation upgrades our established Capability and endows us with new Capability. For half a century, we have sought to develop and refine methodologies and frameworks for planning, building and running the IT systems on which business and governments increasingly depended. But there’s long been a problem with these methodologies and frameworks: they have focused largely, if not exclusively, on the technology as if it is isolated from the rest of the organisation it is supposed to enable. We have seen organisations become hostage to their “IT Governance” practices, unable to change the business because to do so would conflict with priorities set for, and often by, the internal IT function. We have seen project after project deliver a purportedly fine technology solution, which has comprehensively derailed the business at an operational level. Sometimes, even the technology solution is terrible, and that often seems to stem from a problem of business not being able to express what it needs or wants to a disconnected IT service team. Now, as we lurch into the Digital Era, we hear of ongoing conflict between the entrenched “IT Governance” arrangements, which focus on stability and cost, and the needs of the organisation which emphasise agility, disruption and outcomes. Too often, IT Governance arrangements focus on the technology activities and, in some cases put the technology specialists in charge of revising the business process model to suit the technology. When ISO 38500 (Corporate Governance of Information Technology) was published, it included a blunt statement: The main reasons for (these) negative outcomes are the emphasis on the technical, financial and scheduling aspects of IT activities rather than emphasis on the whole business context of IT use. So here is the problem with IT Governance. Nothing has changed. IT Governance is still, largely, focused on the IT, and not nearly enough on the (rapidly) evolving capability of the organisation and the world in which it operates. Leavitt didn’t specifically talk about Business Capability – he didn’t break business down into its constituent parts. However, because it establishes an unarguable framework for addressing business change, Leavitt’s Diamond seems like an excellent tool with which to describe Business Capability. 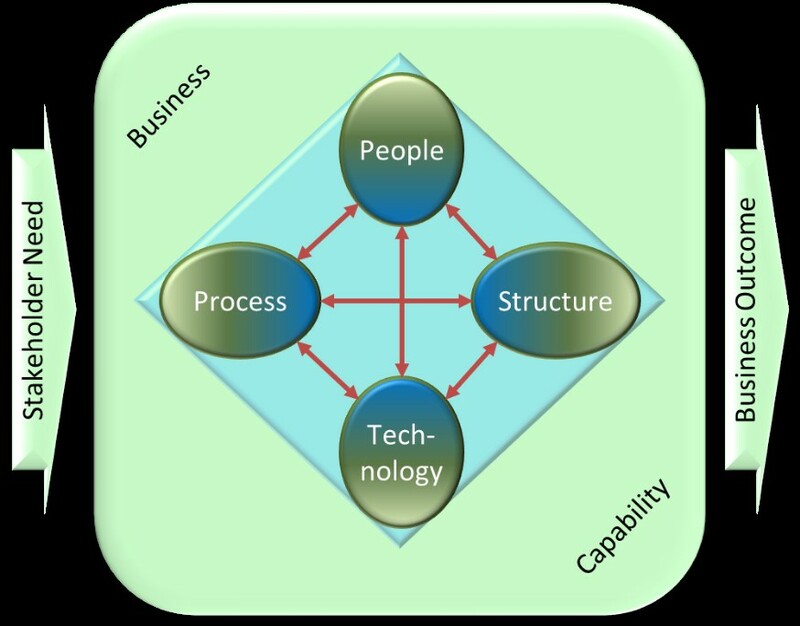 Business Capability is what comes from people who use technology to perform tasks (processes), while operating in a structure (authorities, accountabilities and other rules). Business Capability is a response to the need of an identifiable stakeholder, and it produces a business outcome (which may be a part of a more comprehensive outcome at a higher level). If we look at Business Capability in this way, we can see that to govern change (altering, adding or subtracting capability), we need to govern the four pillars as a whole. To govern them independently risks the primary failure mode that Leavitt identified – the lack of balance in the thrusts of change leading to the pillars getting out of kilter. No wonder that even top class “IT Governance” has so often delivered a sub-optimal result. Those familiar with Capability Based Architecture know that capabilities can be progressively decomposed from a small number of macro units to levels that enable quite fine understanding and control of detail. 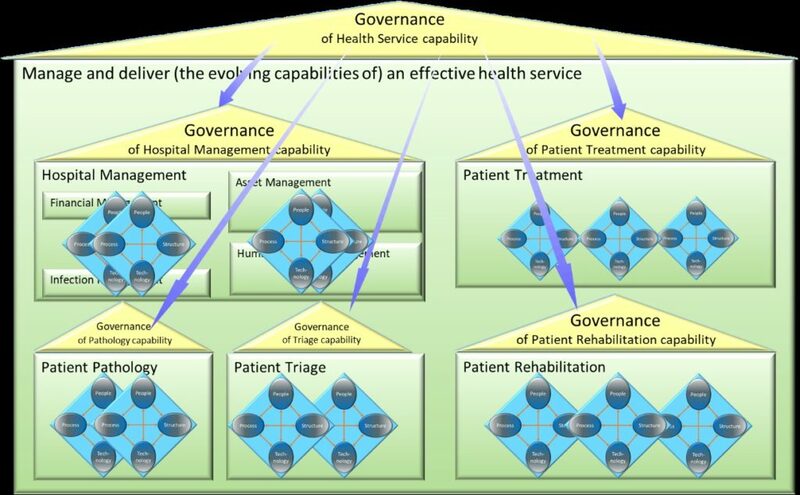 They would also recognise that capabilities can be managed as clusters at the higher level, meaning that to introduce a governance structure over them need not be a significant overhead. By governing Digital Transformation through governance of Business Capability, we derive significant benefits. We have all elements that need to be directed and controlled in one place, so it is easy to resolve issues that arise – we don’t have to wait for multiple external authorities. We can change speed and focus quickly, and stop things are not working out as expected. We no longer need to separate the developmental aspects from the operational, and so have continuity of oversight that enables us to ensure that intended business outcomes are indeed achieved. We eliminate the conflict between individual priorities and performance measures, leading to consistent focus on delivering what is needed, rather than what is best for individuals. Perhaps more importantly, by governing digital transformation integrally with business capability, we can embed the essential elements for a culture of continuous improvement, because part of the governance role should be the constant exploration for opportunities to improve. And when it comes to a new capability, by endowing it with its own governance arrangements, we limit the potential for it to become hamstrung by obstacles to change that may arise as it tries to leverage and integrate with other aspects of the organisation. Digitally enabled exploration of opportunities can be given significant freedom while remaining closely monitored and connected to the rest of the organisation. 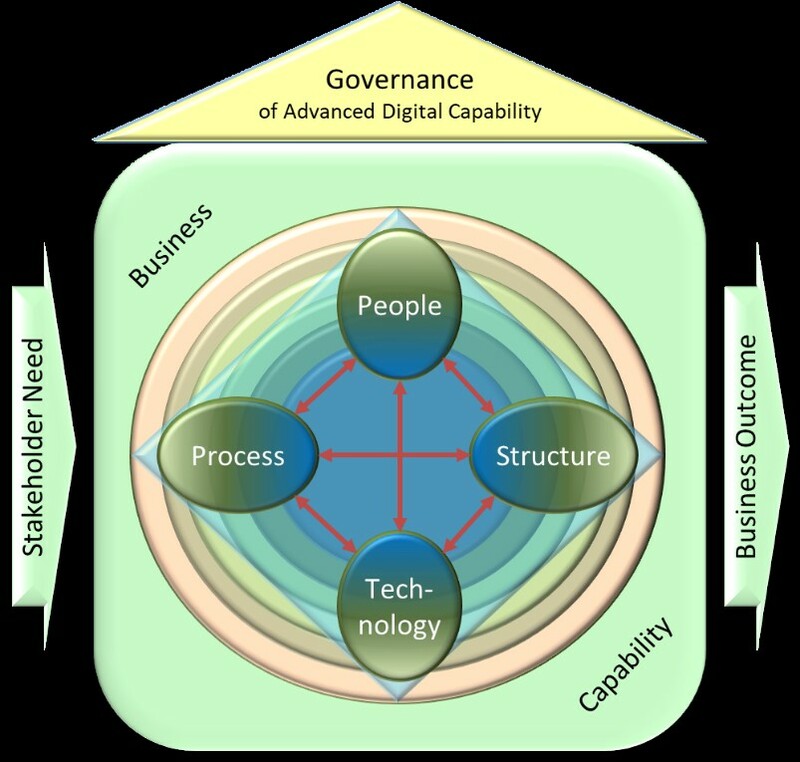 To complete our picture of how we might govern Digital Transformation through governing Business Capability, we can exploit a model that we introduced in Untangling Digital Transformation’s Gordian Knot, published on July 11, 2017. Typical Business Capability today spans well beyond our local environment and is generally linked to, influenced by and impacting on activities that are happening in the six spaces, or landscapes of digital transformation – the local, supplier, customer, regulatory, market and public spaces. Governing Business Capability in the digital era, regardless of whether or not it is undergoing change, requires awareness of and attention to all of these spaces, as activities of others beyond our control can have significant impact on our capability – both positive and negative. Classical approaches to IT Governance cannot provide the extent of visibility, transparency and control needed for Digital Transformation. Organisations looking to survive and thrive in the digital era should refocus on governing Business Capability, and build into their governance model the scope to engage at an appropriate level in the broadly based transformation that is affecting our entire world. In our 9 March 2017 paper ISO 38500 – a Standard to Guide Digital Transformation we proposed that this principles-based standard offers powerful guidance on governance of a digital transformation. We maintain that view, but we recognise that even the 2015 version of that standard can be improved when we think about governing business capability, rather than just governing the use of IT. Principles for Governing Digital Evolution, published along with this paper, re-frames the ISO 8500 principles from their original focus on IT as a business resource to IT as an integral part of business capability. In larger and more complex organisations, there will be a need for certain services to support the Capability Governance arrangements. These services should certainly include Enterprise Architecture to help development and evolution of an efficient and effective set of overall business models, and perhaps an infrastructure services function that can assist with assuring the suitability, integrity and value of the shared technology resources. We will explore these services and their integration into Business Capability Governance in future papers.